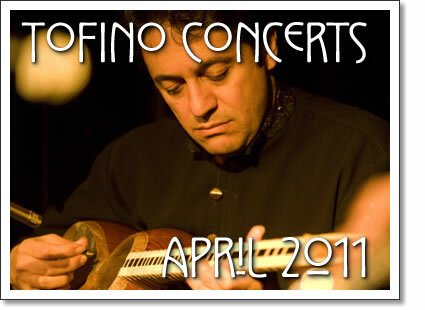 The following concerts in Tofino are happening in the month of April 2011. Tickets for shows at the Tofino Legion are available at Tofitian and Long Beach Surfshop in Tofino. Tickets for events at the Maquinna Pub are available at the door. Safa means inner purity, sincerity, sincere affection in Farsi. Amir Koushkani (persian tar and voice), François Houle (clarinets) and Sal Ferreras (percussion) are Safa. Three players brought together by good fortune and a deep love for music and the art of improvisation. Safa was born when Amir Koushkani appeared at the door of uber-percussionist Salvador Ferreras. It was ostensibly an audition for a spot in the music program at Vancouver Community College, but after hearing just a few notes of Amir’s Persian lute, Sal rushed over to a neighbouring office to get clarinettist Francois Houle. Sal wasn’t looking for a second opinion. He wanted to jam! Major musical chemistry ensued and Safa started to build a reputation as one of Canada’s premier global music ensembles. While Safa’s music continues to be informed and inspired by Amir’s classical Persian traditions, the group brings the prodigious talent and diverse musical experience of its other two members to its stellar mix of composed and improvised performance. Inspired by the profound passion of an ancient Persian repertoire, drawn into the realm of memory, evocation and delight, these three individuals bring to this project contemporary improvisations and neo-traditional settings that unfold in rhythmic play and timbral contrasts. Their work is at times playful, at times humorous, and at other times imbued with an intense rapture that delivers us into another world from which to view the beauty of our own gift of life. Tofino concert listings from Tofino Time Magazine. Shows at the Tofino Legion and other music events in Tofino in April 2011.